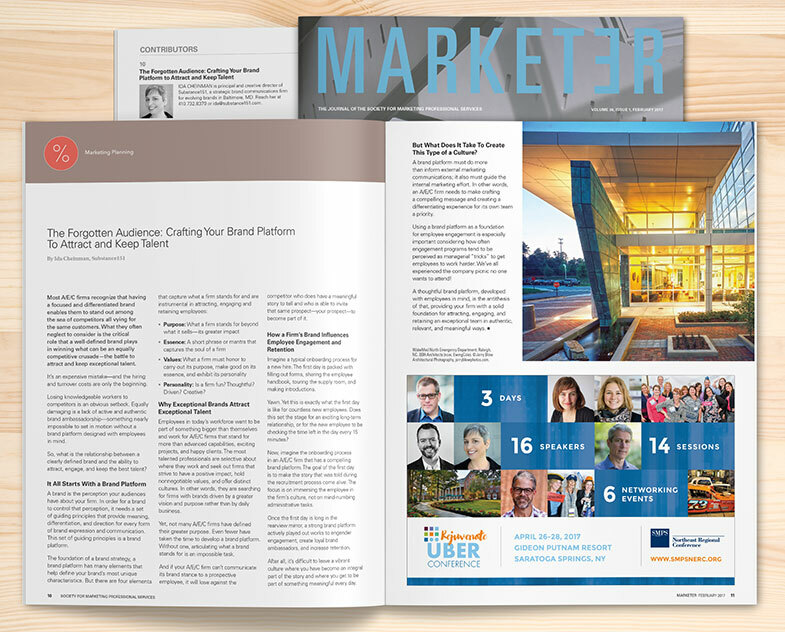 This article was first published in the Marketer – Journal of the Society for Marketing Professional Services (SMPS). Most companies by now recognize that having a focused and differentiating brand enables them to stand out among the sea of competitors all vying for the same customers. What they often neglect to consider is the critical role that a well-defined brand plays in winning what can be an equally competitive crusade—the battle to attract and keep exceptional talent. It’s an expensive mistake – and the hiring and turnover costs are only the beginning. Losing knowledge workers to competitors is an obvious setback. Equally damaging is a lack of active and authentic brand ambassadorship – something nearly impossible to set in motion without a brand platform designed with employees in mind. So, what is the relationship between a clearly defined brand and the ability to attract, engage, and keep the best talent? A brand is the perception your audiences have about your firm. In order for a brand to control that perception, it needs a set of guiding principles that provide meaning, differentiation, and direction for every form of brand expression and communication. This set of guiding principles is a brand platform. Personality: Is a firm fun? Thoughtful? Driven? Creative? Do you Understand the Anatomy of Your Brand [Infographic]? Today’s workforce wants to be part of something bigger than themselves and work for firms that stand for more than advanced capabilities, exciting projects, and happy clients. The most talented professionals are selective about where they work and seek out firms that strive to have a positive impact, hold nonnegotiable values, and offer distinct cultures. In other words, firms with brands driven by a greater vision and purpose rather than by daily business. Yet, not many A/E/C firms have defined a greater purpose. Even fewer have taken the time to develop a brand platform, without which articulating what a brand stands for is an impossible task. And if your firm can’t communicate its brand stance to a prospective employee, it will lose against the competitor who does have a meaningful story to tell and who is able to invite that same prospect—your prospect—to become part of it. Imagine a typical onboarding process for a new hire. The first day is jam-packed with filling out forms, sharing the employee handbook, touring the supply room, and making introductions. Yawn. Yet this is exactly what the first day is like for countless new employees. Does this set the stage for an exciting long-term relationship or for the new employee to be checking the time left in the day every 15 minutes? Now, imagine the onboarding process in a firm that has a compelling brand platform. The goal of the first day here is to make the story that was told during the recruitment process come alive, and the focus is on immersing the employee in the firm’s culture, not on mind-numbing administrative tasks. Once the first day is long in the rearview mirror, a strong brand platform actively played out works to engender engagement, create loyal brand ambassadors, and increase retention. After all, it’s difficult to leave a vibrant culture where you have become an integral part of the story and where you get to be part of something meaningful every day. But what does it take to create this type of a culture? A brand platform must do more than inform external marketing communications; it also must guide the internal marketing effort. In other words, a firm needs to make crafting a compelling message and creating a differentiating experience for its own team a priority. Using a brand platform as a foundation for employee engagement is especially important considering how often engagement programs are chock-full of random ideas that tend to be perceived as managerial “tricks” to get employees to work harder. We’ve all experienced the company picnic no one wants to attend! A thoughtful brand platform, developed with employees in mind, is the antithesis of that, providing your firm with a solid foundation for attracting, engaging, and retaining an exceptional team in authentic, relevant, and meaningful ways. Still have questions? Schedule a free one-on-one brand review with our expert.